I've been chattering for a few years about the rise of mass disability and the role of RCIIT (India, China, computers, networks) in the Lesser Depression. This has taken me a bit out of the Krugman camp, which means I'm probably wrong. Yes, I accept Krugman's thesis that the proximal cause of depression is a collapse in demand combined with the zero-bound problem. Hard to argue with arithmetic. I think there's more going on though. Some secular trends that will be with us even if followed Krugman's wise advice. In fact, under the surface, I suspect Krugman and DeLong believe this as well. I've read Krugman for years, and he was once more worried about the impact of globalization and IT than he's now willing to admit. Sometimes he has to simplify. For example, fraud has always been with us -- but something happened to make traditional fraud for more effective over the past thirteen years. I think that "something" was the rise of information technology and associated complexity; a technology that allowed financiers to appear to be contributing value even though their primary role was parasitic. Similarly, the rise of China and India is, in the long run, good for the entire world. In the near future, however, it's very hard for world economies to adjust. Income shifts to a tiny fraction of Americans, many jobs are disrupted, people have to move, to change careers, etc. It takes time for new tax structures to be accepted, for new work to emerge. IT has the same disruptive effect. AI and communication networks will further limit the jobs we can take where our economic returns are equal or greater than the minimum wage. ... There will also be growing pains. Technology allows firms to offshore back-office tasks, for instance, or replace cashiers with automated kiosks. Powerful new systems may threaten the jobs of those who felt safe from technology. Pattern-recognition software is used to do work previously accomplished by teams of lawyers. Programmes can do a passable job writing up baseball games, and may soon fill parts of newspaper sections (those not sunk by free online competition). Workers are displaced, but businesses are proving slow to find new uses for the labour made available. Those left unemployed or underemployed are struggling to retrain and catch up with the new economy’s needs. In time the economy will adjust -- unless exponential IT transformation actually continues . Alas, the AI revolution well is underway and technology cycles are still brutally short. I don't see adjustment happening within the next six years. The whitewater isn't calming. That is, of course, the Singularity premise, as previously reviewed in The Economist. Update 12/3/2011: And how does the great stagnation play into this - Gordon's Notes: Ants, corporations and the great stagnation? One of the reasons I blog is to engage with a fascinating world, and to track the streams of history. I'm finding that harder to do. It's not that I don't see the streams, or see ways to connect them -- it's that there's too much. I feel as though history just kicked up a gear. Partly this is the loss of Google Reader's share/tracking functions. They were a key component of how I engaged with my fragments of the world's knowledge flow. Even if nothing else had changed, losing those functions and my share repository would be disorienting. I don't think it's just the loss of Reader though. It's more that Reader's capabilities masked the rate of change. Without them, it's easier to see how the world is changing. These are truly whitewater times. Our iPhone-bearing family is going through complex gyrations to claw some money back from AT&T. ... So buying an iPhone 3G may cost $200 less than before, but paying the monthly bill will set you back $240 more over your 2-year contract with AT&T, for a total of $1,680 in subscription fees instead of $1,440 (previously, the lowest monthly voice+data plan cost $59.99 per month). How exactly is that cheaper? The original iPhone looked expensive, but that was only because most of us, including most journalists, can't do grade school arithmetic -- and because the modern corporation has made an art form of misleading marketing. Four years ago Atul Gawande wrote an astounding article on the "stupid little checklist" and its impact on health care. It was a great article, and of course it's been largely forgotten since. Progress is slow. It's hard to keep something so simple and obvious in the public mind; there's no business model. I remembered this article after a recent experience in my own world of corporate software development. For want of a checklist a release was lost. ... For every drowned and pulseless child rescued by intensive care, there are many more who don't make it-and not just because their bodies are too far gone. Machines break down; a team can't get moving fast enough; a simple step is forgotten. Such cases don't get written up in The Annals of Thoracic Surgery, but they are the norm. Intensive-care medicine has become the art of managing extreme complexity-and a test of whether such complexity can, in fact, be humanly mastered. ... Fifty years ago, I.C.U.s barely existed. Today, in my hospital, a hundred and fifty-five of our almost seven hundred patients are, as I write this, in intensive care. The average stay of an I.C.U. patient is four days, and the survival rate is eighty-six per cent. ... intensive-care medicine has grown so far beyond ordinary complexity that avoiding daily mistakes is proving impossible even for our super-specialists. The I.C.U., with its spectacular successes and frequent failures, therefore poses a distinctive challenge: what do you do when expertise is not enough? On October 30, 1935, at Wright Air Field in Dayton, Ohio, the U.S. Army Air Corps held a flight competition for airplane manufacturers vying to build its next-generation long-range bomber. ...The plane roared down the tarmac, lifted off smoothly, and climbed sharply to three hundred feet. Then it stalled, turned on one wing, and crashed in a fiery explosion. Two of the five crew members died, including the pilot, Major Ployer P. Hill. An investigation revealed that nothing mechanical had gone wrong. The crash had been due to "pilot error," the report said. Substantially more complex than previous aircraft, the new plane required the pilot to attend to the four engines, a retractable landing gear, new wing flaps, electric trim tabs that needed adjustment to maintain control at different airspeeds, and constant-speed propellers whose pitch had to be regulated with hydraulic controls, among other features. While doing all this, Hill had forgotten to release a new locking mechanism on the elevator and rudder controls. The Boeing model was deemed, as a newspaper put it, "too much airplane for one man to fly." The Army Air Corps declared Douglas's smaller design the winner. Boeing nearly went bankrupt. They could have required Model 299 pilots to undergo more training. But it was hard to imagine having more experience and expertise than Major Hill, who had been the U.S. Army Air Corps' chief of flight testing. Instead, they came up with an ingeniously simple approach: they created a pilot's checklist, with step-by-step checks for takeoff, flight, landing, and taxiing. Its mere existence indicated how far aeronautics had advanced. In the early years of flight, getting an aircraft into the air might have been nerve-racking, but it was hardly complex. Using a checklist for takeoff would no more have occurred to a pilot than to a driver backing a car out of the garage. But this new plane was too complicated to be left to the memory of any pilot, however expert. Medicine today has entered its B-17 phase. Substantial parts of what hospitals do-most notably, intensive care-are now too complex for clinicians to carry them out reliably from memory alone. I.C.U. life support has become too much medicine for one person to fly. Yet it's far from obvious that something as simple as a checklist could be of much help in medical care. Sick people are phenomenally more various than airplanes. A study of forty-one thousand trauma patients-just trauma patients-found that they had 1,224 different injury-related diagnoses in 32,261 unique combinations for teams to attend to. That's like having 32,261 kinds of airplane to land. Mapping out the proper steps for each is not possible, and physicians have been skeptical that a piece of paper with a bunch of little boxes would improve matters much. In 2001, though, a critical-care specialist at Johns Hopkins Hospital named Peter Pronovost decided to give it a try. He didn't attempt to make the checklist cover everything; he designed it to tackle just one problem.. line infections. On a sheet of plain paper, he plotted out the steps to take in order to avoid infections when putting a line in. Doctors are supposed to (1) wash their hands with soap, (2) clean the patient's skin with chlorhexidine antiseptic .
. Pronovost asked the nurses in his I.C.U. to observe the doctors for a month as they put lines into patients, and record how often they completed each step. In more than a third of patients, they skipped at least one. The next month, he and his team persuaded the hospital administration to authorize nurses to stop doctors if they saw them skipping a step on the checklist; nurses were also to ask them each day whether any lines ought to be removed, so as not to leave them in longer than necessary. Pronovost and his colleagues monitored what happened for a year afterward. The results were so dramatic that they weren't sure whether to believe them: the ten-day line-infection rate went from eleven per cent to zero. So they followed patients for fifteen more months. Only two line infections occurred during the entire period. They calculated that, in this one hospital, the checklist had prevented forty-three infections and eight deaths, and saved two million dollars in costs. Pronovost recruited some more colleagues, and they made some more checklists. The researchers found that simply having the doctors and nurses in the I.C.U. make their own checklists for what they thought should be done each day improved the consistency of care to the point that, within a few weeks, the average length of patient stay in intensive care dropped by half. The checklists provided two main benefits, Pronovost observed. First, they helped with memory recall, especially with mundane matters that are easily overlooked in patients undergoing more drastic events. (When you're worrying about what treatment to give a woman who won't stop seizing, it's hard to remember to make sure that the head of her bed is in the right position.) A second effect was to make explicit the minimum, expected steps in complex processes. Pronovost was surprised to discover how often even experienced personnel failed to grasp the importance of certain precautions. In a survey of I.C.U. staff taken before introducing the ventilator checklists, he found that half hadn't realized that there was evidence strongly supporting giving ventilated patients antacid medication. Checklists established a higher standard of baseline performance. ..
... 2003, however, the Michigan Health and Hospital Association asked Pronovost to try out three of his checklists in Michigan's I.C.U.s. It would be a huge undertaking. Not only would he have to get the state's hospitals to use the checklists; he would also have to measure whether doing so made a genuine difference. This past summer, I visited Sinai-Grace Hospital, in inner-city Detroit, and saw what Pronovost was up against ... between 2000 and 2003 Sinai-Grace and eight other Detroit hospitals were forced to cut a third of their staff, and the state had to come forward with a fifty-million-dollar bailout to avert their bankruptcy. ... they were, I discovered, filling out those pages. Mostly, it was the nurses who kept things in order. Each morning, a senior nurse walked through the unit, clipboard in hand, making sure that every patient on a ventilator had the bed propped at the right angle, and had been given the right medicines and the right tests. Whenever doctors put in a central line, a nurse made sure that the central-line checklist had been filled out and placed in the patient's chart. Looking back through their files, I found that they had been doing this faithfully for more than three years. Pronovost had been canny when he started. In his first conversations with hospital administrators, he didn't order them to use the checklists. Instead, he asked them simply to gather data on their own infection rates. In early 2004, they found, the infection rates for I.C.U. patients in Michigan hospitals were higher than the national average, and in some hospitals dramatically so. Sinai-Grace experienced more line infections than seventy-five per cent of American hospitals. Meanwhile, Blue Cross Blue Shield of Michigan agreed to give hospitals small bonus payments for participating in Pronovost's program. A checklist suddenly seemed an easy and logical thing to try. In what became known as the Keystone Initiative, each hospital assigned a project manager to roll out the checklists and participate in a twice-monthly conference call with Pronovost for trouble-shooting. Pronovost also insisted that each participating hospital assign to each unit a senior hospital executive, who would visit the unit at least once a month, hear people's complaints, and help them solve problems. The executives were reluctant. They normally lived in meetings worrying about strategy and budgets. They weren't used to venturing into patient territory and didn't feel that they belonged there. In some places, they encountered hostility. But their involvement proved crucial. In the first month, according to Christine Goeschel, at the time the Keystone Initiative's director, the executives discovered that the chlorhexidine soap, shown to reduce line infections, was available in fewer than a third of the I.C.U.s. This was a problem only an executive could solve. Within weeks, every I.C.U. in Michigan had a supply of the soap. Teams also complained to the hospital officials that the checklist required that patients be fully covered with a sterile drape when lines were being put in, but full-size barrier drapes were often unavailable. So the officials made sure that the drapes were stocked. Then they persuaded Arrow International, one of the largest manufacturers of central lines, to produce a new central-line kit that had both the drape and chlorhexidine in it. In December, 2006, the Keystone Initiative published its findings in a landmark article in The New England Journal of Medicine. Within the first three months of the project, the infection rate in Michigan's I.C.U.s decreased by sixty-six per cent. The typical I.C.U.-including the ones at Sinai-Grace Hospital-cut its quarterly infection rate to zero. Michigan's infection rates fell so low that its average I.C.U. outperformed ninety per cent of I.C.U.s nationwide. In the Keystone Initiative's first eighteen months, the hospitals saved an estimated hundred and seventy-five million dollars in costs and more than fifteen hundred lives. The successes have been sustained for almost four years-all because of a stupid little checklist. Jobs was the best salesman of the past 50 years. I wonder, though, if deep down he knew what was real and what was not. iWork. iPhoto. Aperture. Calendar.app. iCloud. MobileMe. Must be the very best eh? Some of what Apple produces is excellent. Some of it is 3rd rate. A lot of it is second rate. If Apple's leadership really believes they are always "the best" they are delusional and Apple will become an average publicly traded company. Another Microsoft, another Google. Apple's flagship product is the iPhone -- and there are lots of issues with the cost/value it delivers compared to Android. Apple needs to work very hard, and with clear eyes, to increase the value they bring to their customers. Is there anyone in Apple whose job it is to question Apple's own myths? Rick Perry, unlike Mitt Romney, grew up on the wrong side of the tracks. So maybe he considers Obama's lower middle class life to be extraordinarily privileged. By that standard, I was presumably privileged -- and I remember being short of food on occasion. Science, the media and the Himalayan glacier. What's wrong? Of course since the first IPCC report the world has exceeded the worst case scenarios for carbon emission; despite the first American depression since the 1930s. So when do today's mainstream climate scientists expect those Himalayan glaciers to vanish? I thought this would be easy to discover, even though far too much science is still behind paywalls - despite some uncelebrated but huge progress in the waning days of the Bush II. I thought with the clues in the abstract I could find new disappearance predictions, perhaps for more specific regions of the Tibetan/Indian glaciers. I couldn't -- at least not in my 20 minute time budget. There's something wrong here. Something wrong with science, the media, us, Google, or all of the above. I'm positive there are mainstream predictions, but scientists aren't marketing them -- and the media isn't digging. We need scientists with more spine, because nobody else has any. The abstract overstates the significance of the "gaffe". Humanity was, and is, profoundly unready to think about global climate change. We would have found another reason to defer thought. GigaOm has a longish cloud computing post around a Peachtree Capital Advisors investor survey (full report is by request only). By enterprise software they presumably mean Microsoft, Oracle, SAP, etc. I was struck by the declining interest in social media. That may be because investors figure it's a mature segment (!) and Facebook owns it. Or that consumers are (re)turning to Cable TV. I think both may be true. When a sclerotic company like Google 2.0 jumps into a domain, you can be pretty sure it's yesterday's news. Consumer tech cycles are viciously short now; fashion designers understand this all too well. BBC news Jan 14, 2012. In a shocking move earlier today the European Central Bank announced an orderly default of Greece and the appointment of Professor Paul Krugman as the head of the Bank. In a brief speech Dr. Krugman dumped a paper bag of Euros from the podium. "There's plenty more where they came from" he said. "I'll get 3.5% inflation if I have to print them myself". Within moments of these announcements China and the United States each purchased 200 billion Euro Bonds in a new offering. ... The industrial park that’s sitting underwater still in Thailand will be out of action for at least four months, I’m told, and possibly as long as 12 months. And what happens then? Why another monsoon, of course! The flooded industrial park, built in an old rice paddy on a historic flood plain with little added drainage will go under water during the next big storm, too. The hard disks manufactured in the flooded region are nearly all 3.5-inch drives, so those will be most immediately affected. Since 2.5-inch drives are in ascendancy with 1.8-inch almost out of business and 3.5-inch in decline, the global product mix is likely to change even more, with 3.5-inch drives possibly reaching end-of-life earlier than expected. Are these the floods Kisner predicted? I don't know of course. In 1981 I remember wading through Bangkok's PraduNaam (water/fish market) on the way to the office. The city has flooded before. Thailand will flood again. Still, this is what we expect -- bigger events happening more often. Most people, however, didn't expect the world supply of computer components to be restricted. Thailand has come a long way since I lived there. What lessons can we learn? What lessons are technology companies learning? They're learning that in the "whitewater world" risk has to be distributed. Manufacturing cannot be concentrated in one region, one country, or even one climate zone. We will have to learn redundancy and flexibility. The companies that learn that first will have a large competitive advantage. Today is a good day to have a functioning disk drive factory. I don't trust Google 2.0. Microsoft has a fat target now. I'm not exactly a TV guy. Emily and I watched Star Trek Next Generation. That was early 90s. Before that, MASH I think. After that, almost nothing. Saw a Simpson episode once. Even so, I knew there was a TV celebrity named Oprah, that she lived in Chicago, was black, a Democrat, and fabulously wealthy. Sometimes I'd see Oprah magazine around the house, but I don't think I ever read it. So I read Caitlin Flanagan's The Glory of Oprah empty of impressions. What a hell of a life. A good time to invest in old bicycles? As all my friends know, I'm one of those annoyingly cheerful Pollyannas, nothing like that Kassandra fellow we all ignore . This is how balance sheet or even liquidity trap recessions are supposed to end. It may take a very long time, but eventually people spend. Or wars happen and governments spend (oops, that wasn't so optimisitic). There are some countervailing sentiments however. Europe is doing a slow motion version of the Crash of '09. Maybe we'll get to see how it plays out without massive governmental intervention . Meanwhile, perhaps related to the slow motion train wreck of European finance, Google is cutting back on its projects. Adobe just shut down its decade-long investments in Flash, Flex, and Air. Olympus is collapsing because it can no longer conceal losses from 17 years ago -- and nobody believes Olympus is the only Japanese, or US, company with falsified accounts. ATT is squeezing customers hard. Apple's quality problems continue. In a development that goes largely unnoticed, corporations are taking a "destroy the village to save it" approach to information security. The diversion of corporate wealth to elite compensation continues, with effects that are poorly understood. Lastly, our whitewater world is no less frothy, complexity attacks are still ubiquitous and virtually unnoticed - and the AIs are getting smarter . If you're a 'structuralist', you'd say that the Great Disruptors are still working on the world order. And there's the "China bubble" (334,000 Google hits today). So is this a good time to invest in proven bicycles, long lasting antimicrobials, and garden tools? Well, bicycles are always a good idea, but I suspect what lies ahead is, as usual, a lot like what lies behind. Somethings are improving. Other things are worsening. So the US will see some trendline improvement with periodic disruptions -- and we'll be lucky to do that well. We all know, of course, that the curse of Cassandra was that she would be always right and always ignored. Meanwhile quantum computing is looking more real every day. Not that that will be disruptive. What are the consequences of extreme executive income? Despite a few hiccups in our economy, the diversion of money to executive compensation continues, particularly to the shareholder employees  of large publicly traded corporations. The US is in the lead, but other countries are following a similar trend. I've seen much discussion of the trend, but not so much about the effects on corporations - regardless of social justice or market operation . I don't think we know what it means, but I can make some informed guesses. First, we can dispense with the myth that employees don't know what CEOs are paid. I suspect even people working with their arms and backs know their CEO's compensation. Certainly middle-management and knowledge workers know. So how does that affect employees? And, perhaps more interestingly, how does it affect executives? Employees, in most corporations today, see limited raises, underfunded projects, difficult work conditions and employment uncertainty. They do the arithmetic; half the CEO's compensation would fund all the projects they know of. This has obvious and direct effects on morale. No, they don't imagine they'll sit in the CEO seat one day, or even another C-seat. Employees aren't that dumb. How does this affect executives? Well, it's a rare human who doesn't think they deserve their salary. If you pay a CEO 50 million dollars, they assume they deserve 50 million dollars. They can do arithmetic too. This must mean they are 250 times smarter, faster, wiser, stronger, and better than their superstar worker bees. They have gifts far beyond the ken of mortal men. It also moves the executive class into a different sort of reality. They still age and die, but most of the time that is forgotten. They are free of the other concerns of mortal life. They don't fly coach. They don't deal with time tracking and travel expenses. They don't have to manage their Flex accounts. Their lives are relatively complexity free. Executive hyper-compensation may explain a lot of the poor decisions and poor returns of the modern publicly traded company. Not so much from the diversion of revenue, but from its impacts on employees and, most of all, because of its effect on executives. The CEO, CFO, etc of a publicly traded company are, in theory, employees of shareholders. I think this is a market failure. I've known several CEO class executives. They are not necessarily imaginative, insightful or academically intelligent, but they are always good at operating in the corporate setting, they always work very long hours, and they always sacrifice a great deal. Whether that helps the corporation or not is debatable; their selection pressures are complex. Even so, it would be reasonable to compensate a CEO of this sort at 1-2 million dollars (total) a year. We are far beyond that level of compensation at large PTCs. There is a contrary argument of course. At a certain level of power and wealthy, individuals gain direct access to the global wealth stream. There are many ways to divert tens of millions of dollars from that stream that don't involve working for a PTC. Perhaps that's what boards are bidding against. I liked Google 1.0. Even in its fading days it gave us the data liberation front. The DLF had a twitter feed. Their last post is dated September 15th, 2011. MOUNTAIN VIEW, Calif. — Larry Page, Google’s chief executive, so hates wasting time at meetings that he once dumped his secretary to avoid being scheduled for them. Google 1.0 was powerful, but it tried to do good. I could overlook its effective monopoly because it did so many good things for me personally -- and it was occasionally goofy. Google 2.0 is powerful, and ruthless. It reminds me of another monopoly that was astoundingly successful seventeen years ago. Google may be similarly successful, but I hope not. I don't think Google 2.0 will handle power well. The Subaru is in the shop, so I get an extra day of bike commuting this week. Most weeks I'm allowed one day of bike commuting leisure, but this week I have two. It's a blessing. During today's commute though, the shifting was rough. I adjusted the cable, but it didn't help. Finally, i took it down to my workshop. Wow. I'm amazed that Shimano Deore XT derailleur could shift at all. It was coated with sedimentary rock forming from strata of clay and oil and leaf and the odd bug. After a bit of excavating and polishing thought it shifts like new. This touring/commuting bike just keeps going. Yes, I did have cyclocross wheels put on and I recycled some nice components, but the basic bike was pretty fine. It gets pathetically little maintenance, but it still runs. a (hard fork!) 1988 Trek mountain bike and the Cannondale. Bikes are good stuff. Spend a bit of money and get payback for fifty years. 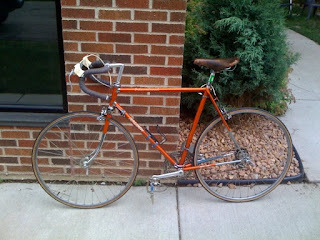 AT&T and Google may give me hearburn, but a good bike is a joy forever. The Keystone Pipeline XL (Keystone Expansion) is a part of a multi-billion dollar project to "transport synthetic crude oil and diluted bitumen from the Athabasca Oil Sands in northeastern Alberta, Canada to refineries in Illinois and Oklahoma, and further to the U.S. Gulf Coast". There is debate about the project, but the media coverage is hard to follow. That's because there is an "elephant in the room". (see - unspoken). The elephant is carbon. If we taxed CO2 to offset the externalities of global climate change the Keystone XL would not be built and the existing Keystone pipeline would be dismantled. Of course if we had a Carbon tax the price of energy would rise about 10%, though that would be offset by the increasingly low costs of solar power. It's easy to see why the media is missing the Keystone XL story. Without a Carbon Tax, or the regulatory equivalent, the Keystone XL makes business sense. A Carbon Tax, however, is a wee bit unpopular. It's easier for XL opponents to talk about other environmental impacts such as oil spills, water contamination and the like. Of course once Keystone XL is built, instituting a carbon cost would mean dismantling a suddenly irrational multi-billion dollar investment. So maybe we should be talking about the real issue now. It's a similar story with coal plant carbon sequestration. To the surprise of nobody whose paying attention, it's not happening. Shareholders would fire the CEO of a corporation that invested in carbon sequestration without either a carbon tax or the regulatory equivalent. There's more than one elephant in this (too small) room. The other is Peak Oil, defined as the beginning of the end of the good stuff. It's gotten lost in the so-far-lesser depression, but our fracking and Keystone investments are consistent with Gwynne Dyer's 2008 prediction. We are now post-peak-oil. There's a twist to this story though. Is a Carbon Tax really all that unpopular? Governments need money to provide services an aging and increasing disabled population needs. There's no happy way to increase taxes. Compared to the alternatives, a Carbon Tax may not be as unpopular as we imagine. Maybe that's why nobody is talking about it. When politicians are forced to deal with big problems, they prefer to keep the real solutions behind closed doors. AT&T, one of my least favorite vendors, raised our family mobile costs last week by about $450 a year. That's a risky thing to do to customers, as Netflix recently discovered. ... [I think ... ] They are preparing for the end of their text messaging revenue stream. ... This year, AT&T changed its messaging plans to push new subscribers into an all-or-nothing price plan where they pay per text or pay up for unlimited. The bet is most people who weren’t on unlimited plans will find themselves paying more or getting stuck with insanely high bills for sending a few too many texts. ... That’s how AT&T is squeezing out the last bit of value from its cash cow, but it’s undoubtedly aware that such draconian measures or too-high-rates on the unlimited side might push people over to the third-party apps even faster. The downside to most of those apps is that users have to make sure their friends are also on the service, which can be complicated. For carriers, the downside is they are trading high-margin texting revenue for barely profitable data use. Turns out we're right on target then, because our response to AT&T's mandatory data plan/cost increase is to drop our $30/month unlimited texting plan (offsets price increase exactly) and switch to a combination of Facebook Messenger and Google Voice while disabling all texting . As predicted, AT&T's moves are accelerating customer migration from their most profitable revenue stream. If Apple were to make iMessage available as an app and independent of texting we'd go that way; we're still exploring options. AT&T is required to do that on request. They don't like to admit it's possible. Say you want "administrative texting only". We also dropped a $5/month "Smart Limits for Wireless" plan because that is useless with smarphone accounts. There are other responses that AT&T won't like. As long as we have to pay a data plan, we might as well get a contract too. That redirects AT&T's revenue to Apple, and let us make money by selling either the new or older phones. The sharing challenge: access, topic and identity. Why G+ fails. Setting aside the act of mass datacide that moved Google up my corporate evil scale, G+ suffers from a fundamental Circle problem. It may be an attempt to work around Facebook patents rather than a misguided design, but either way it doesn't work. These aren't sufficient. They put far too much of a burden on the publisher to create and maintain a multitude of Circles that pre-coordinate Access Control and Topic definition . The pre-coordination work fails due to combinatorial explosion . A full set of controls looks like this. Multiple identity: where identity is a set of access controls and topic definitions. Access controls: who can see what. A full set of controls seems more complex, but the workload largely falls on the Publisher, not the consumer -- and the combinatorial explosion problem is resolved. Subscribers choose which topic to follow. Unfollowing all topics is equivalent to blocking a person's posts but not their comments. Google Reader Social had no access controls (that I remember), but it did allow multiple identities (an identity is equivalent to a subset of topics). The topic controls were very weak (subscribe to tags - almost never used), but the UI made it very easy to pick items of interest from a large stream. The G+ UI makes the combinatorial problem much more significant. Google has promised pseudonym support. That will be roughly equivalent to a subset operation on Circles. Boolean operations on Circles would also somewhat alleviate the publisher combinatorial problem. Alleviate, but not eliminate. Sooner or later, G+ will need to separate access control from topic definition. Note too the 3 people on earth who'd probably appreciate this. This is identical to the pre- and post-coordination problems that bedevil anyone who works with concept based knowledge representation ontologies, including clinical terminologies/vocabularies like SNOMED and (yech) ICD-10-CM and ICD-10-PCS. A Sept 2011 WSJ post on "injury by falling turtle" in ICD-10-CM causes of injury illustrates this also. See #1. Top end of the scale is 15. It's a linear scale. My personal scale rates large for-profit corporations. CARE International is provided as a baseline measure and Philip Morris shall forever define the upper limits of corporate evil. CARE International: 1 (They're not a PTC, so this is merely a non-evil reference point)What's your ranking? There's been a lot of action since the 2009 1st edition. Google was once tied with Apple, but the manner and actions of the Reader affair moved them, for the first time, above Microsoft. They're heading into Facebook territory, even as Facebook itself is improving. AT&T and Verizon are slowly rising up the scale , breaking into the top five for the first time. Conversely Microsoft has been relatively angelic over the past two years. They are incompetent, yes, but this is a scale of corporate evilness. Similarly Netflix is not so much evil as incompetent. Apple, for all its sins, has stayed relatively low on the chart. They take our money, they mostly give us what we expect. They did nuke several customer services, but with a 1 year warning (vs. Google's 1 week warning before eliminating my shared reader items). For about two years my son has used my old iPhone on our family plan. He has never had a contract and he doesn't have a data plan. The phone is configured not to use cellular data, it does have text messaging. He has data access only via wifi. Today AT&T enrolled him in a mandatory data plan because "he has a smartphone". His text messaging stopped working, perhaps because his cellular data was turned off. I called AT&T, put his SIM card into his old phone and they said they'd remove the data plan. However, they haven't done it yet , the charge is still showing on our family bill. Instead of enrolling him in the lowest cost data plan, he was auto-enrolled in the highest cost plan - $26/month. So not only are iPhones carrier-locked in the US, they also incur an unwanted data plan even when they cannot use any cellular data, even when the user has no subsidized phone, and even when the user has no contract. I am having a very bad week with evil corporations. First Google, now AT&T. If I wasn't already an OWS fan I'd sign up. I'm researching what will happen if I get an AT&T GoPhone package and swap the SIM card into the iPhone. If that works I'll take both of our kids off the family plan. With iOS 5 on my iPhone 4 we can also drop our family texting plan and simply pay per text. In the meantime I'll review the policies of Sprint, Verizon and anyone else. AT&T has complicated my life, but perhaps we'll save some money. On a 2nd call I was told it would be reversed. Update 11/4/11: I've been ruminating on what AT&T is trying to do. I think they have a rational goal, which they are pursuing in the blundering and inept manner of almost all publicly traded corporations. They are preparing for the end of their text messaging revenue stream. They figure they can hold onto voice for a while; longer than most of us think. They do, however, expect Apple, Google, Facebook and others to steal text messaging. So in the short term they're getting as much money as they can out of text messaging, while ensuring every single customer has a data plan. They can't get away with mandating a data plan for a dumb phone customer, but they would do that if they could manage the outrage. Eventually they'll give up on text messaging entirely, and make do with data plan revenue. That transition may be painful, so they'll try anything they can imagine to increase data plan usage. Update 11/23/11: Our Attorney General sent a letter to AT&T, which prompted a call to my home from a member of their "executive response team". Nice to know they have some sensitivity to these kinds of actions. I'll schedule a discussion with them. Kain is write about "sharebros". I never heard of it, and I was a mad sharer. Good article about Hivemined, despite the "sharebros". ... The location of buttons, while annoying, does not ruin Google Reader's sharing utility. There's a Facebook site for we shattered refugees. There I found a ranting Hitler parody that's particularly appropriate. I like the last line. Me too.